1 of 3 Heat oven to 375 degrees F. Place sausage in a nonstick skillet over medium-high heat and cook 5 minutes, until browned on all sides. 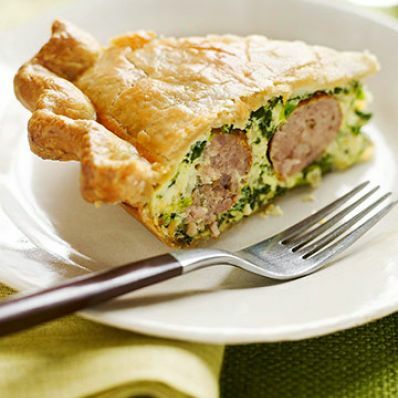 2 of 3 In a large bowl, combine sausage, 5 eggs, spinach, mozzarella cheese, ricotta, shallot, pepper, garlic powder and salt. Line a 9-inch pie plate with 1 of the pie crusts. Spoon in the sausage-and-spinach mixture. Top with the remaining pie crust; seal and crimp edges. Poke a few holes in the center of the pie crust and brush with the egg-water mixture. 3 of 3 Bake at 375 degrees F for 1 hour, 15 minutes. Let stand 10 minutes before slicing.